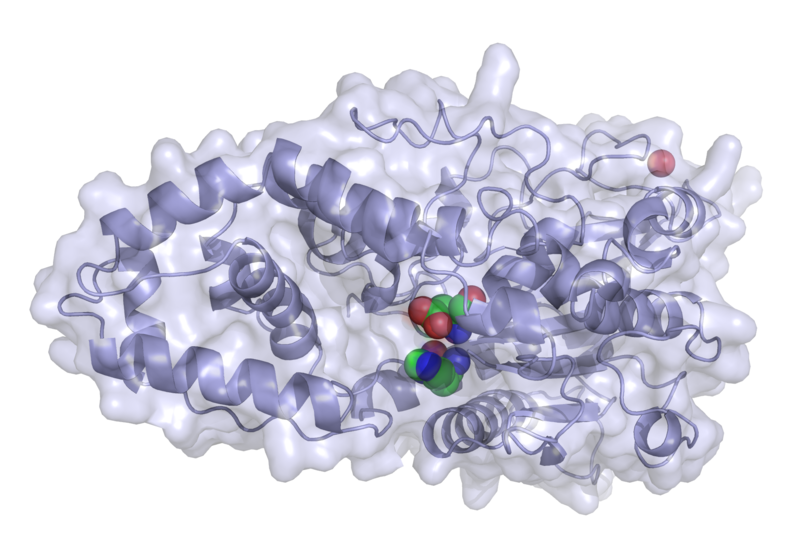 … What is an enzyme and how does it function? Enzymes are a type of protein able to catalyse certain specific biochemical reactions. Enzymes are known to catalyse more than 5,000 biochemical reaction types. For example the enzyme xylanase degrades the xylans present in hemicellulose, while another enzyme called cellulase degrades cellulose. The other compounds that can be found in cereals are proteins – degraded by the proteases, various lipids that are degraded by lipases, starch, mannans and phytins, which are degraded respectively by galactosidases, mannanases and phytases. Some of these enzyme types are naturally produced by animals while others like the phytase, for example, are not and should be supplemented in the feed to facilitate optimal growth performance for farm animals. There is a multitude of enzyme preparations especially developed for different feed applications readily available on the world market. The enzyme specificity towards its substrate comes from its own unique three-dimensional structure. Enzymes are usually globular proteins that can act alone or in groups of several molecules. Enzymes are made up of long amino acid chains folded in a specific pattern to create a unique three-dimensional structure. This structure, establishes the catalytic capabilities of an enzyme and is held up by a multitude of weak chemical interactions within the amino acid chain itself. Most of these interactions can be broken by high temperature or chemical agents, which leads to the unfolding (denaturation) of the protein. In most cases, this causes a loss of activity (inactivation) and renders an enzyme preparation useless. Denaturation usually happens at temperatures above a certain threshold, specific for the organism that provided the enzyme preparation. Because of this, preparations derived from heat-resistant microorganisms are very valuable for the industry, because of their ability to function properly at extremely high temperatures (80 – 105°C), which greatly increases the rate of enzyme-assisted reactions. Why are enzymes so popular in the feed industry? The main goal of implementing feed enzymes is to augment animal and economic performance, by increasing the utilization rates of ration ingredients in feedstuffs. • Improves gut health by improving digestion, decreases the amount of undigested nutrients entering the lower gut and influences the gut microflora towards more desired bacterial species. A natural result is better overall animal health, partly due to the gut flora improvement and its influence on the immune system performance. • Lowers excrement output in terms of volume and nutrient excretion, namely nitrogen and phosphorus, which is a direct result of higher utilization rate of these nutrients. The environmental impact of these benefits is of significance to most intensive animal facilities worldwide. • Enhances gut integrity and morphology, resulting in better nutrient absorption and higher digestibility of feedstuffs. • More fodder types can be used in feed formulas, because the restrictions on the inclusion rates of poorly digested additives are decreased or removed by adding enzymes to the feed. • Reduces the water content in excrements and prevents incidents of wet litter in animals fed high NSP diets. • Reduces the nutritional value deviation between different batches of an ingredient with different quality. This boosts fodder production efficiency and contributes for the precision of the feed formulation. Thermostability and how is it connected to/its connection with enzyme activity? In order to answer this question, first we have to go over the feed production process in greater detail. 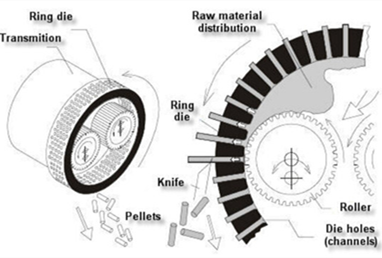 - pelleted feed, where the different diet components are compressed down into pellets with roughly the same size. Both forms have their advantages and disadvantages, however for the purposes of modern day farms, feed pelleting has become essential. - Mixing – in this stage is produced the dietary mixture. There are no particular complications or problems with enzyme implication. - Conditioning – here the mash is conditioned and moistened. The moisture and temperature of the mixture is adjusted with high/low pressure steam and the mash temperature can vary from 45 to 75°C. - Pelleting – here the conditioned mash is processed into pellets. During this quick process, the mash can reach temperatures in excess of 90°C over a short period of time, thus producing a feed pellet. In general, farm facilities prefer the use of pelleted feeds because of the numerous advantages of these over simple feed mash. However, there is one drawback of the pelleting process – the high heat and humidity involved are detrimental to standard feed enzymes. As previously stated enzymes are very reliant on their structure to function properly. Moreover, the feed pelleting process involves temperatures around and even in excess of 90°C, under these conditions the common enzymes denaturate and loose enzymatic activity. In the past, several enzyme preparations have been developed to withstand temperatures up to 80°C, however such temperatures are detrimental to the pelleting equipment and decrease die life time considerably. Now, however with the current breakthroughs in enzyme technology we have been able to create enzyme preparations that can easily/naturally withstand temperatures up to 95°C. One such product is VemoZyme F NTP – a naturally thermostable phytase. How to solve the problem with enzyme thermostability? There are several methods to go about the problem with enzymes and heat. • One is to add the enzyme preparation after the pelleting process, and thus skip the heat treatment of the mash. However, this approach strictly requires the use of a liquid enzyme preparation alongside with specialized flow and dispersion control equipment that increases production time and requires additional efforts, costs and personnel to operate. A powder form enzyme preparation can also be used, however in both cases a problem with uneven distribution of the preparation arises, since homogeneity is hard to achieve in a constant feed flow. • The second method uses the so-called “coated” enzyme preparations. In short, the coated enzymes are an ordinary enzyme in regards to thermostability but coated with a “mechanical shield” that protects the enzyme from high temperatures and unfavorable environment factors (pH for example). • Тhe third method is to implement a thermostable enzyme that can withstand the temperatures involved in turning feed mash into feed pellets, without a significant loss of activity – one example can be the current 3rd generation enhanced phytases that have raised denaturation temperature from the 60°C of the second generation enzymes to 90°C. That allows the addition of enzyme at harsher pelleting conditions. Implementing coated enzymes and intrinsically thermostable enzyme preparations solves the problem with uneven enzyme distribution in the feed and also does not require additional specific equipment. However due to their nature, “coated” enzyme resistance to high temperatures and chemical influences comes from the coating itself, not the properties of the enzyme. Because of this, they are regarded to as a “work-around” solution to enzyme stability and are not a subject to this article. On the other hand, the intrinsically thermostable enzymes are regarded as the more advanced solution to the problem with enzyme stability during feed processing. To conclude, over the past years enzyme supplementation to animal feed rations has become essential to the animal farm industry. With growth of pelleted feed demand worldwide, there is also a strong demand for enzyme preparations that are able to withstand the pelleting process. Because the application of standard non-thermostable enzymes requires the implementation of highly specialized equipment and inconvenient liquid enzymes, there is a strong demand for thermostable feed enzymes, since they are easier to use, do not require any modifications to existing production lines and provide for better animal performance in practise. VemoZyme® F NTP offers these advantages providing 5000 U/g or 10000 U/g phytase activity, being able to withstand temperature 95°C.